British Life Guards charging French infantry at Waterloo. The Household cavalry was composed of 3 regiments - the 1st and 2nd Life Guards, and the Royal Horse Guards ("The Blues"). These regiments did not see action in the Peninsular War until the end of 1812. At that time, they wore a helmet with a flowing horsehair mane. 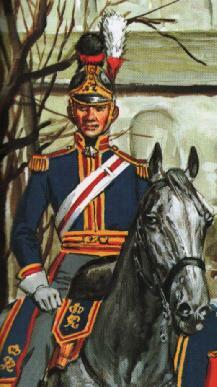 The horsehair mane was changed in 1814 to a woolen crest which was coloured dark blue over red (see illustration above). The new helmet was worn at Waterloo. The uniform of the 1st and 2nd Life Guards was a scarlet jacket with blue facings on the cuffs which were usually obscured by their white gauntlets. The Royal Horse Guards wore a blue jacket - hence their nickname, "The Blues". They had red facings on collar and cuffs. 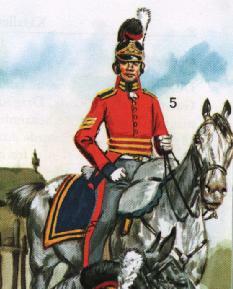 On campaign, the household cavalry wore grey trousers (overalls) with a red stripe. At Waterloo, the 3 regiments of household cavalry fielded 2 squadrons each - totalling 696 men - i.e an average of 116 men per squadron. Illustrations taken from Liliane and Fred Funcken, Historische Uniformen - reproduced with kind permission of the authors.